The Heavyweight Punch - limited edition canvas, stretched and framed. Geoff Hunt's spectacular series of prints depicting some of Admiral Nelson's most famous commands. 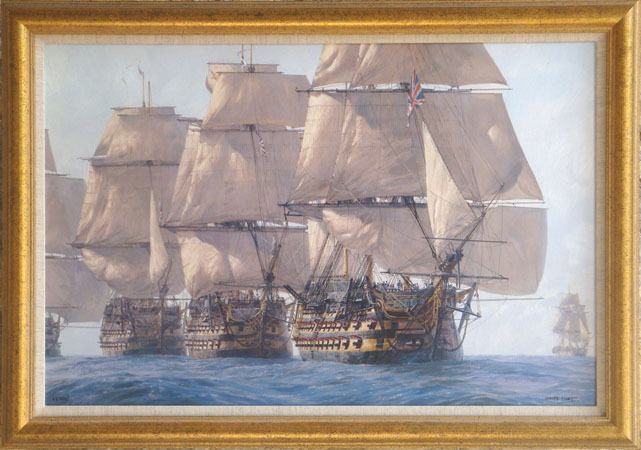 Five of the prints show HMS Victory in the dramatic build-up to the Battle of Trafalgar, including the moment of that most famous signal: England Expects that Every Man will do his Duty..
Finally,Victory Breaks the Enemy Line - one of the most exciting paintings of the Battle ever made - shows the climactic moment as Nelson drives her into the French and Spanish line, her sails already rent by the unreturnable fire she endured during the long approach, and prepares to fire a devastating broadside into the stern of the French flagship Bucentaure. 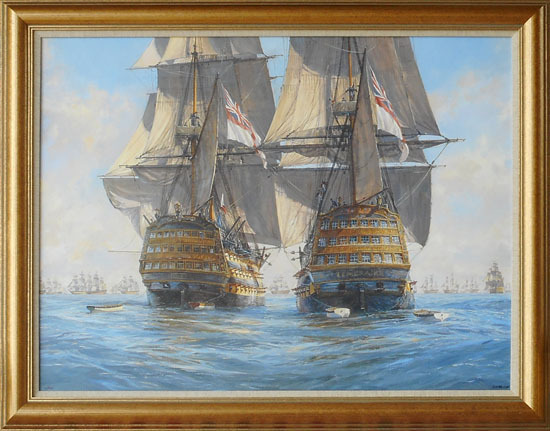 Two prints depict Nelson's favourite HMS Agamemnon - in her 1795 battle with the Ca Ira and a year later as his first flagship, at gunnery practice in the Mediterranean. Subjects of the remaining prints in this superb collection are HMS Boreas, HMS Vanguard and HMS Captain. "Victory races Temeraire for the Enemy Line." Large size canvas, framed.